Over 500,000 Square Feet of Climate Controlled Showroom Space throughout the Nation! Drive-in and Drive-through (sometimes spelled Drive-thru) are storage rack configurations that allow the forklift to drive directly into the lane of stacked rows (called a bay). The only difference between drive-in and a drive-thru pallet rack systems is simply whether the bays have an entry at only one end, or at both ends. Drive-in rack systems use a common entry and exit for forklift travel, while drive-thru systems have entry points at either end of the bay. Because a drive-in racking system has only one entrance, it uses what is known as a LIFO (last in, first out) storage method. With only one entrance, the last pallet put into a row is the first one to be taken out. A Drive-Thru rack system, with two different entry points, can also use a FIFO (first in, first out) storage method. With a FIFO system, pallets are loaded in one end and are pushed back to the other end, where they are then at the front of the row on the opposite side. The first pallet put into such a row is the first one taken out at the other end. This system is advantageous for material with an expiration date or whenever shelf life is a major concern. A drive-in rack system comes in all different configurations. Most people use a 40”wide x 48” long wooden pallet for storing products in there warehouse. In a typical drive-in or drive-thru bay the distance between the rails that support your product will typically be just a few inches wider than the overall width of the pallet. The systems themselves can be just about as deep as you would like them. 2,3,4& 5 deep systems are the most common however. In a nutshell, if you have a products that don’t have specific product rotation requirements or that will come in to be stored in large volumes and pulled and shipped in large volumes then Drive-In/Drive-Thru racking can really capitalize on your existing or new warehouse space whereby creating many more pallet positions within your facility than if you were to use traditional selective pallet racking. We have a large stock of drive-in and drive-through pallet rack equipment. 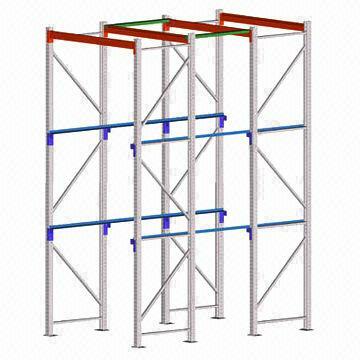 Drive-in racks help improve storage efficiency by removing the necessity for aisles. 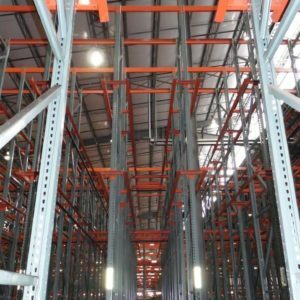 When floor space is limited Drive-in/through racks can help you gain up to 60% in total usable storage area, helping you achieve maximum high density storage. Drive-in and Drive-through pallet rack storage is the best choice when storage density is your primary concern. We will meet your high density storage needs. If your warehouse inventory is frequently changing, or if you are looking for a higher-density storage solution, drive-in and drive-through racking can be better options than traditional racking systems. Drive-in and drive-through racking systems eliminate the use of selection lanes between the storage areas of the structure and, instead, allow forklifts to drive directly into the bay where inventory is stored. A drive-in system allows for access only from one side, while a drive-through system allows for access from both sides. The rails in a drive-in racking system rely on standard pallet sizes to improve storage density and make your warehouse more productive by making it easier for workers to access inventory. These racking systems also involve less energy for heating or cooling inventory in the factory space since there is less air and more product density, making them more energy-efficient. Because forklifts have to do less driving to pick up inventory, this type of racking can also be more fuel-efficient.